Buy the Farm . . . Share: Boaring! Tonight it was unseasonably cold. Actually, that's a lie. It's just that I've noticed recently people like to say "it's unseasonably cold" even when it makes perfect sense for the season. For example, it was 16 degrees yesterday morning. Admittedly that is chilly but given the fact that it is winter that really shouldn't warrant any comment at all. Tonight the temperature was seasonably cold. Given the coldness of the evening Jen had the idea to make this stew she recently observed on Everybody Likes Sandwiches, her favorite food blog. For those of you who haven't read it before you should. It's like this blog only with better food, better design, better photography, more awards, and better writing. In fact, what are you doing still reading this lousy site? 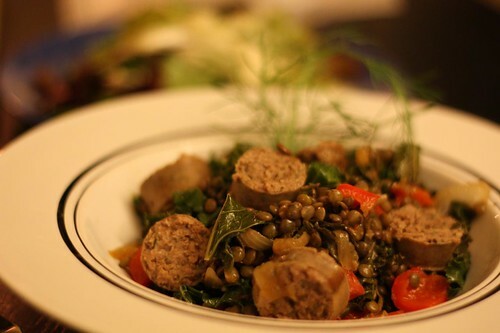 lentils with fennel, kale, and sausages (which, in turn adapted it from a recipe in Gourmet). After checking out the recipe (or just reading the name of the dish, my lazy equivalent of reading a recipe) I was ready to get started! 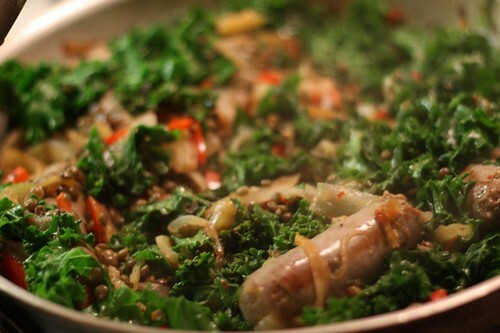 I browned up some sausage in a pan, added some olive oil, garlic, sliced onion, fennel, red pepper, kale, red pepper flakes, and cooked French lentils. Lentils are something I never even consider cooking with until Jen brings it up. I have a real blind spot for lentils. Maybe it's because they're so small. Maybe I should consider only making the bright orange ones because they're easier to see. Maybe I should just stop yammering on about lentils. I had hoped to find an adequate kielbasa-like sausage at the market but they didn't really have anything. 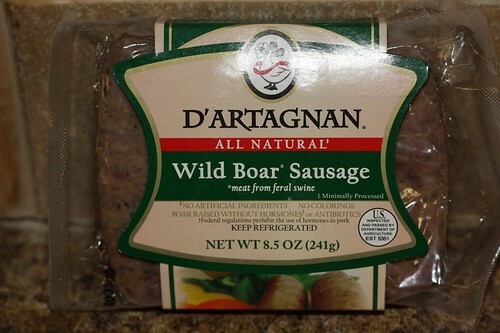 I did find this wild boar sausage. I purchased it mainly because the package boasted "made with feral swine!" That just seemed like perhaps the folks at D'Artagnan should have gotten marketing involved with the packaging in this case. At any rate it worked on me. I didn't advertise the source of this sausage to Jen ahead of time as I thought it might turn her off. She is very prone to prejudging dinners based on ingredients and since this dinner was her idea I didn't want it to be ruined for her before she even had a bite. 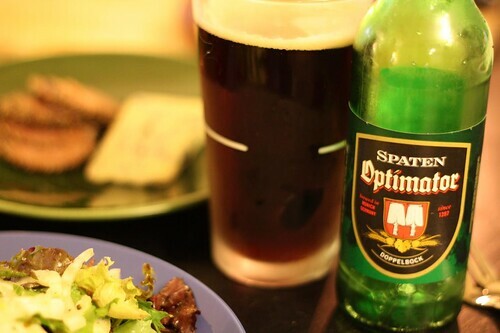 For beer I had an Optimator by Spaten. After spending last weekend in Austin drinking Shiner Bock it was nice to have an authentic German version of the same beer. This probably wasn't the best match for the meal but since there were sausages involved I figured that a German beer would be the best way to complement the meal. At 7.2% ABV it turns out I was right!